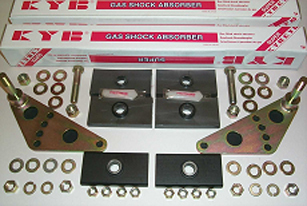 British Automotive has introduced a redesigned rear upper shock absorber mounting bracket kit. This kit is suitable for Koni, Spax, Monroe and British Automotive's KYB telescopic shock absorbers. 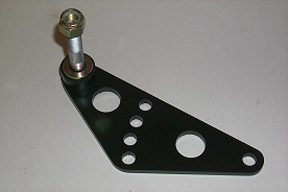 This newly design upper mounting bracket kit is available under part number S/ABS.BRKT. The brackets are left and right handed, and are now incorporated within the complete shock absorber kits S/ABS.KIT and S/ABS.MKIT. 1. A new upper shock absorber mounting pin position with a maximum offset of 3.1/4" upwards which, depending upon your vehicle's rear suspension ride height, may not require the change over of the OEM shock absorber lower link mounting plates from side to side. between 5 and 8 degrees. The following image shows the British Automotive KYB kit applicable to the MGB & MGA models. 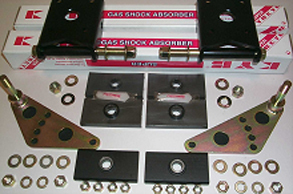 NOTE: This kit utilizes your OEM lower shock absorber link-mounting bracket in the existing position. 2. Nylatron spring seating pads (lower). Fitted with Delrin "O" ring locators. 2 1/2" Lower spacer blocks. 2 1/2" x 2.5" SAE bolts. (1)…. Measure the distance between the rear axle bump stop pedestals and the progressive bump stop rubbers. This distance represents the amount of suspension travel available under "bump" conditions. Remember that the rear ride height has a direct relationship with this measurement. (2)…. Measure the distance from the upper bracket shock absorber mounting stud to the center of the OEM shock absorber link mounting plate hole. * Since the shock absorbers contain no internal bump stop, we have allowed 1/2" compression of the bump stop to prevent damage from "bottoming out". Continuing… Observing the Working Length dimensions above, we would, ideally, like to have an equal amount of "bump" and "rebound" shock absorber travel. However, this is not entirely possible. As indicated previously, our main efforts should be in providing sufficient shock absorber travel so that the unit does not "bottom out". Using the Ideal "Bump" Travel dimension above, compare this to the measurement taken in (1) previously. Is this measurement more than 3.0", or less than 3.0"? The dilemma facing us is what amount of "bump" travel is acceptable if this measurement is less than 3". I consider 2.1/2" to be the minimum. If you have appreciably less than this you should consider raising the rear ride. We recommend the installation of British Automotive's variable ride height front spring eye bracket and adjustable rear shackle assembly. Please note that the front spring eye bracket is also used for the installation of British Automotive's traction control kit (composite springs only). When used in conjunction with this device, the bracket is redundant for increasing the rear ride height. Installing new OEM steel leaf springs as an alternate would require the owner to use the original OEM lever type shock absorber. This is due to the horrendous arch that is prevalent with new steel springs, which produce excessive rear ride heights. In this circumstance, before upgrading to telescopic shock absorbers, it would be better to let the springs settle over a period of time. Working with the Extended Length dimensions above, compare this to the recorded measurement you have just taken. If this measurement is greater than the Extended Length dimension above, the shock absorber would in actual fact limit the amount of rear axle droop, and not the axle check strap. Next, measure the distance between the bump stop pedestal and the progressive bump stop rubber. This measurement now represents the amount of suspension travel the rear axle goes through before actual bump stop contact is made. The above shock absorber Working Length dimension must fall within this measurement.